Why You So Crazy is the 10th studio album by The Dandy Warhols, released by Dine Alone Music on January 25, 2019. A free-wheeling jaunt through the band's disparate influences and talents that feels like a victory lap in a sense—but not necessarily in a bad way. Their latest album Why You So Crazy is a phantasmagoric journey that dials up their Velvet Underground influences. It’s experimental, but lacks any purpose resulting in a patchwork of songs without a focus. "Why You So Crazy" does not shy away from any genre and effortlessly plays the listener with a funky wah-wah guitar in "Thee Elegant Bum", country and folk in "Small Town Girls" and futuristic synth-pop in "To The Church". Is it better to burn out than to fade away? 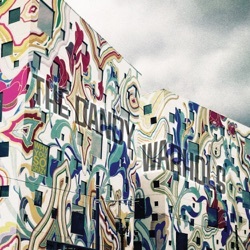 With The Dandy Warhol's Why You So Crazy, fading away seems like the only option. With a great deal of respect to a band that has been around for quarter of a century, this isn't their finest hour. This LP just gently passes you by, revealing itself to be devoid of any truly memorable songs. Why You So Crazy feels less like a bold artistic statement and more like a missed opportunity. Their new album Why You So Crazy, checks all the Dandy Warhol boxes we’ve come to expect – the unexpected! The mix of so many different styles makes it seem as though this is almost an album full of B-sides and scrapped material from the past two decades. The songs on this album span a range of sound that is altogether extremely forgettable. My problem with the Dandy Warhols has always been that while they may have some good pieces, in the aggregate they seem like a show band that empathizes with styles but does not really live in them. Like Oregon's Fair-Haired Dumbbell, it's a whole lot to take in, but it'll grow on you. The Dandy Warhols do not want to prove anything to anybody. Why You So Crazy may not then be an entirely successful enterprise but it is an intriguing album, and you can only admire the Dandies for taking musical risks like this a quarter of a century into their career. Why You So Crazy – a question they might ask themselves. They sound most true to form when they stick to their psych rock roots, and while their innovation, creativity, and sense of humor are certainly respected, Why You So Crazy begins to lose its authenticity when it starts to lean into the world of parody. Diversity alone does not make a good overall work, and "Why you so crazy" does not only clash with a sometimes bumpy album flow, but also with some immature song ideas in some places. It meanders through strange psychedelic territory in a manner that is engaging but far from obvious. Unfortunately, neither Why You So Crazy’s eclecticism nor its polish can make up for its lack of memorable songs.